Far from putting me off them forever, judging the Liskeard Bun has reignited my love for all things bun. Yeasted or not, plain or fancy, there is something rather wonderful about the British bun. Looking through my copy of Cranks Recipe Book one night, as you do, I spotted a recipe for Raspberry Buns. 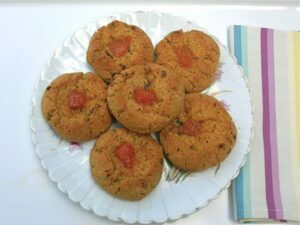 They looked like a slightly softer version of rock cakes with a blob of jam in the middle – a sort of cakey thumbprint biscuit. I’d just made my second batch of vanilla apricot jam and was keen to start using it, so raspberry buns went out the window and apricot buns were born. Of course I changed the recipe a bit and used a mix of spelt and freekah flours instead of ordinary wholemeal and sultanas instead of currants. I also added some vanilla vinegar to the buns, which provided an additional vanillary note as well as helping the buns to rise. The buns were a huge success and received favourable compliments from everyone that tried them. I might have to try raspberry buns next! 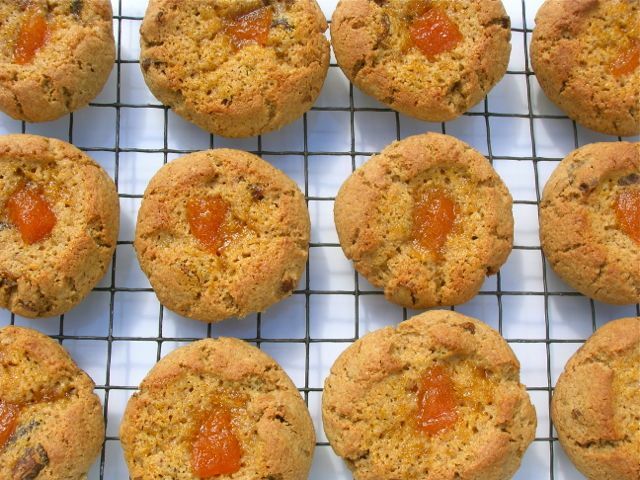 A sort of cross between a rock cake and a thumbprint biscuit, these buns are made with a mix of wholemeal spelt and freekah flours. Rub the butter into the dry ingredients until the mixture resembles breadcrumbs. Make a well in the middle and break in the egg. Add the vinegar and 1 tbsp water. Stir with a knife from the centre outwards until the mixture comes together to form a dough. Add a little extra water if the mixture is too dry. Divide the dough into twelve and roll into balls between our hands. Place well apart on a greased baking sheet. Make holes in the middle using a wet finger or thumb and fill them with the apricot jam. Bake at 180C for 18-20 minutes when the cakes should be well risen and golden. Remove from the tray onto a wire rack to cool. Buns can be made entirely with spelt flour or even plain wholemeal flour. Apricot jam can be used instead of vanilla apricot jam. Whilst I’m on the subject of Cranks, have you seen my Cranks lunch hamper giveaway? There’s only a few days left to enter, so do hurry. This may only have one duck egg in, but it’s a most important egg, especially as it might be the last for a while. When I went to our Friday market last week, I was told that the ducks were moulting and there would be no eggs for a while – very sad face! So I am sending these off to Simply Eggcellent as my contribution to Dom’s birthday festivities. J is for Jam and as the apricot jam is a key ingredient here I’m sending these off to Alpha Bakes over at The More Than Occasional Baker and Caroline Makes. It’s back to basics with Love Cake this month over at Jibber Jabber UK. Well you can’t get more basic than a British bun, even if it does use fancy flours and fancy jam. I’ve only recently come across Freekah in is grain form and I love it. Intrigued to see it comes as a flour variant too. Is it gluten free? It’s quite new to me too Claire. I doubt it’s gluten however as Freekah is a wheat grain. My girls would love those buns… and they would make such a great lunch box item as well. Yes Margot, fab for lunch boxes and picnics too. From the moment I read the recipe I knew these would be on my list of things to bake in the near future. Well, I just did make them …..
As the weather is bad and I didn’t want to go shopping, I had to adjust the ingredients. Never heard of freekah flour. Just had one of these cookies (why do you call them buns ?) and they are delicious ! The adjustments I made are as follows: 100 g each of wholemeal and white spelt flour, 75 grams of ground rolled barley, 50 grams of ground dry roasted mixed nuts, small packet of organic vanilla sugar, 1 tbsp apricot liqueur instead of water. The instructions were followed meticulously. The cookiebuns are quite large and pleasantly filling. To be totally recommended ! Crikey, there’s no holding you down Henk. That has to be the fastest anyone has made one of my recipes after posting. I bet the apricot liqueur made a good addition – I have never had apricot liqueur. Freekah flour is an ancient wheat that is harvested green, then smoked. These are definitely more bun than cookie. You’ll have to try rock cakes and then you’ll know what I mean – it’s a very British thing. Forgot to ask: why the vinegar ? Is is to enhance the effect of the baking powder ? Forgot to say: thanks for the inspiration again ! Ah yes, the vinegar. I probably wouldn’t normally use it, but I had some vanilla vinegar and yes I added it both for flavour and to help the rise. Mine rose quite a lot. So glad you maDe them Henk and thank you for doing so and letting us all know how you got on. Much appreciated. Last week I made a second batch of these ‘buns’. Still no freekah here, so I stuck to my alternative nuts and barley as it works very well. I slightly diminished the amount of vinegar and compensated with a little more liqueur and deepened the hole so I could put more jam in. The buns are quite big and pleasantly filling. In the near future I’ll probably try a red fruit variety with chopped cherries and/or cranberries and a matching liqueur and jam. Now that I write this, I feel this future nearing upon me. Of course your very British rock cakes are on my list to, someday. Henk, I think you should start your own blog, you are so creative with your adaptations. Would love to see the pictures. That’s a kind thing to say Choclette, but I have never even owned a camera …. I am happy to be just an enthousiastic follower. Anyway, I haven’t tried the red version of these buns yet, but, inspired by your recent Grasmere-post as well as last years oaty-ginger-chocolate-cookies, I decided to try and be efficient and combine these 3 recipes in one bun. I stuck to the nuts and barley and added 1 tsp. of ground ginger. Instead of the apricot I used 100 g of dark chocolate, chopped in uneven bits. With the egg I added 10 g of vinegar and 20 g of ginger liqueur. In the middle I put a tsp of chopped crystallized ginger. The result is one of the best cookiebuns I have ever had (really !). Thanks again. Of course the red fruit version is still on the list, as well as something with coconut (and Malibu ?). To be continued ! Oh well, I’m very happy for you to be an enthusiastic follower and to keep coming up with such wonderful variations of our own. Ginger liqueur? I never knew there was such a thing. You must have a veritable treasure trove of alcohol in your house. A little misfortune last week: I tried a version with toasted pistachio’s, white chocolate and rose jam and it didn’t work one bit ! None of the tastes really came through and the texture wasn’t good at all: too much spread out and rather chewy. Of course they were still edible and fortunately my mum loves them, so nothing is wasted 🙂 They were just not as nice as I had hoped and expected. Finally I made a red fruit version of these buns today. I stuck to the barley flakes, but used chopped roasted hazelnuts (we went shopping in a large German supermarket two weeks ago, and baking ingredients are a lot cheaper than in The Netherlands and the UK ….). I used 1/2 tsp of ground cinnamon, no vanilla, a little blackberry liqueur, cranberries and raspberry jam to (over)fill them. I make deep holes and use a lot of jam in each bun, because me and my friend really like it that way. I made the ‘mistake’ of not chopping the cranberries which caused the dough to be very crumbly, making it a little difficult to shape them and put holes in them. On the other hand: if you keep them whole, the cranberries have a better ‘bite’ and the taste is more prominent. Choices, choices. Anyway, I just had two with my tea and they are delicious ! Next time I will try the recipe without the vinegar, and put lines of dark chocolate on top of the buns after baking. In fact, I could still do this. Chocolate is good with both raspberries and cranberries. With white chocolate they would look quite Christmassy …. I didn’t realise food was expensive in the Netherlands too – it must be something to do with small over populated countries! Ah! Apricot buns sound delicious! Yes Riz, they are delicious and makes me wonder why I don’t make more of our British bun style cakes. These buns look almost like my favourite thumbprint cookies! Both spelt and freekah are my favourite grains. Ah yes Angie, I know you are a fan of these ancient grains. I’m with you there and I’m sure our bodies are better adapted at digesting them. Thank you Sina, you’re very kind, especially as not all of them are vegan. oh and bravo that duck egg! I get into panic mode at this time of year, wondering where I’m going to get any decent eggs. I love my Cranks Recipe Books – have used them for many years. I always feel quite nostalgic when I do a Cranks recipe Heidi. That’s a lovely story Penelope. We only ever had homemade jam, so apricot was not something I tried until I went to France. freekah is top of my list to try. I cant wait to get my hands on some. Do you have anything specific you want it for Bintu? It’s a great name isn’t it Kate. I like the history of it too. I’m sure the buns would work with gluten-free substitutes though. I love buns like this. My husband doesn’t like apricots so I may have to resort to the raspberry originals or have them all to myself! Your creativity never fails to amaze me. I’ve never baked with vanilla vinegar before. These buns look delicious and I wish I could have a few now with my cup of tea. Thanks for entering AlphaBakes. Haha Ros, thank you. I like to surprise a little. After the first red fruit version attempt (see comment of the 16th of December), I made another batch the day after. Without the vinegar this time and with blackberry jelly instead of raspberry (none left after having used the last two tablespoons for a delicious raspberry flavoured salad dressing). There was no noticeable difference in rise and they were equally ‘scrumptious’ (a word I picked up from watching Mary Berry judging for the Great Britisch Bake Off). My mother was very pleased to receive a tin of these buns; she really loves them. Still didn’t put chocolate on because my friend doesn’t like chocolate in/on his bakes; he only eats a few specific types of chocolates and bonbons. Finally, the buns I make are less tidy than yours. The whole cranberries as well as the barley and hazelnuts cause them to be quite rocky in appearance. Also I make the holes wider and deeper to be able to put a lot of jam/jelly in. I like this texture very much. I do like hearing about your bun project Henk. I sounds to me that you should just have a go at making rock cakes, but make a whole in the middle so you can add some jam. Thanks very much Amy, I really appreciate you taking the time to comment. Love to hear of kids baking with their mothers, especially boys. I’ve just finished running a giveaway for 3 copies of The Cranks Bible, but you’re a bit late for that. I keep meaning to try more recipes from Cranks but my “to make list” is several years long! Hehe! I love my original Cranks but always seem to make the same handful of recipes from it – so I’ve decided I’m going to work my way through methodically, trying a new cake and a new savoury each week. Sounds like a terrible chore doesn’t it 😉 It would be a fun thing to blog about I think but I know I’d never find the time so I’ll have to leave that to the experts like yourself. Thanks again for the inspiration! Sounds like a wonderful plan Amy. Good luck and thank you. I’m still getting the follow-ups from this post. Recently made these buns again, because they are just so good . We took them on our trip to Normandy last week to have something to chew on during our hill walks over muddy paths. They fill you up nicely for a while because of the wholemeal flour and energy is released over a longer period of time. So, if I may make a little suggestion here: start with making these Amy. You won’t be disappointed ! Next version of this bun I have in mind is to fold the dough around an amarena cherry or around a small ball of almond paste to make a filled bun. Wouldn’t that be nice ? Glad to hear they haven’t lost favour with you Henk and saw you safely through Normandy. A ball of marzipan wrapped up in the middle sounds like a mighty fine variation to me. I bet she was Henk. I think it’s time I made some again too as, like you, I have lots of jam to use up. Thanks for your tip on leaving the dough to rest. I shall try that.